Trousers with a subtle structure and stylish look. 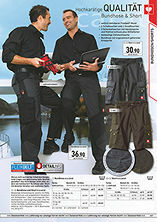 Thigh pockets on both sides, each with flap, Velcro fastener and attached mobile phone pocket with pen compartments. Two internal ruler pockets, two side pockets, left with safety pocket and two back pockets, right with flap and Velcro fastener.